There existed many old grape varieties in Catalonia; many of them in much greater numbers before phylloxera. In the days that followed this catastrophic attack to European winemaking there was something of a viticultural reckoning and many were lost, or nearly lost. While a name such as “colló de gall” (rooster balls) that you can find up in Empordà is amusing, one of my favorites is the relatively rare white grape of Escanyavella or “old lady strangler”. 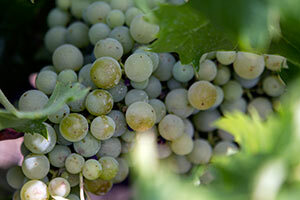 Found on the slopes of Priorat, it’s generally mixed in with other grapes that are classified as White Grenache. Many of the white wines of the region will often have a few grapes from Escanyavella in the blend that total just 2-3% but there’s one wine that’s actually 100% Escanyavella which is produced by Marc Ripoll Sans in Gratallops which I’ve written about previously. As Escanyavella isn’t a permitted grape in DOQ Priorat, how on earth can you make a qualified wine from it? There are many parts that come together to make this possible but Marc is one of the very few people in the region to have newer vines of this grape, although they number very few and allow him to produce only about 600-800 bottles depending on the year. “While my vines were planted 25 years ago, they are classified as experimental vines and we use them to see if this wine can eventually be a permitted grape under the DOQ regulations. If you’ll recall, Viognier, which they’ve been using in France for forever took 15 years to approve, so it’s a slow process.” As an aside, despite fully bordering DOQ Priorat, the grape isn’t, or more to the point, has yet to be found anywhere in DO Montsant according to a very knowledgeable viticulturist I spoke to. This of course leads in to the very curious name and the reason I jokingly gave a bottle to my mother in-law once. “Escanya-vella” earned its name quite literally for its most basic characteristics. It’s a tough-skinned grape that holds a good deal of acidity. Unlike other grapes in the vineyard, if you wanted to eat it, it could very well make you choke a bit. Using old winemaking approaches, it wouldn’t often lend itself to very elegant wines. However, through many years of experimentation of different aging and viticulture techniques Marc and his wife Sònia (also an enologist) have managed to craft one of the finer white wines to be found in Priorat. Thanks to the renewed interest in old, native grapes in Catalunya, this wine’s days of being the lone Escanyavella in Priorat are coming to an end as a new wine from Porrera has just been released. Albert Costa is producing it under his Clos l’Asentiu project which is a company that allows him to create more experimental wines separately from the very well-known Vall Llach which he co-owns with Lluís Llach. He started producing the first wine in his “Dones” (women) series in 2014 which was a fresh, Provence-style Grenache rosé he named Matilde. In 2015, he introduced a red named, Catalina. This year, the newest lady in the series is Joaquina, a white produced from about 75% Escanyavella, with a little bit of Macabeu and a very small amount of Viognier. The unifying theme for all these wines is that they are small production wines each made in single 500L amphorae lined with wax. As Albert says, “These wines allow us to experiment and have a bit of fun during the harvest. With the Joaquina, it also helps us to preserve these old varieties.” Joaquina’s grapes were previously all going in to the Aigua de Llum of Vall Llach which will now be 100% Viognier going forward which also means it will be reduced to only 1,000 bottles in total now. 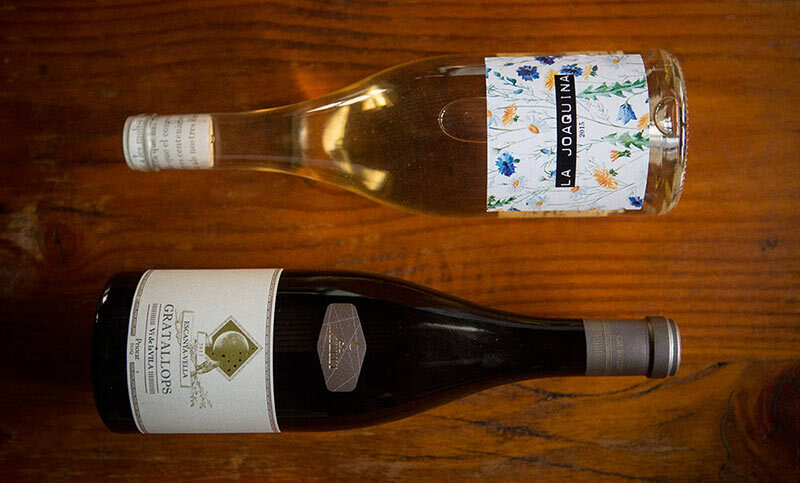 In regards to the names of women, he’s been naming each of the wines after one of the older women of the Porrera who, back in their younger days worked the vineyards. “It’s thanks to them that we have the grapes we do today in Priorat” says Albert. Joaquina and Matilde are both 85 while Catalina is the oldest resident of Porrera at 102. They’re all still quite vibrant and active, being seen about the village regularly and Catalina was quite notorious for often taking a hose and spraying noisy weekenders eating in the restaurant terrace below her window on weekends once it was after midnight. Given the high degree of activity of not just them but the other senior residents of Porrera, Albert decided that for each of the roughly 600 bottles sold, 2€ will go to the local town hall to fund workshops and activities for the older demographic in the village. So despite its apparent rarity and lack of the hallowed history of say Grenache or Macabeu, Escanyavella is a very rare grape that refused to die off, perhaps one of the most poignant examples of resilience of the Catalan spirit. Little by little it’s making strides to being more present and enjoyed and we can only hope that we continue to find such treasures from our past and bring them forward with us to the future. History aside, naturally the biggest question for anyone is, what does a wine from this grape taste like? Both Marc and Albert were gracious enough to give me samples of their most recent vintages so I could share my impressions although the two wines vary vastly from one another as both are trying different ways of making this wine. Golden straw in color. Exotic spice notes of old wood and a touch of lychee. Medium body and acidity with light, pleasing citric notes that follow in to the finish and a rounded quality overall. Pale straw in color with cream, pineapple, and citric touches as well as light herbal notes of fennel. Overall medium acidity and body it holds a touch of grapefruit in the finish.